Why choose Unity 3D for the development of your mobile games ? Unity 3D is one of the most comprehensive platforms for developing games in the world. Allows creation of games for multiple platforms from a single development, including console games for (PlayStation, Xbox and Wii), desktop (Linux, PC and Mac), browser, mobile and tablet (iOS, Android, Windows Phone and BlackBerry). It is possibly the fastest growing technology right now, especially with the recent update that facilitates the development of 2D games. Its main limitation is the price of their full license, which can reach and exceed $ 4,500 for a full license for one person. Consider the reasons for this, the characteristics of this environment, its limitations and its current state. Browser: List all elements (or assets) for your projects. Let’s you easily sort your application. In this view are your pictures, scenes, scripts, audios, prefabs, textures, atlas and all items that will use or can use your game or application. Hierarchy:Hierarchical list of the elements of your scene. Scene:Design and layout of your entire screen or play or a section of it. Each scene represents a different level or section of the game (cover, level 1, level 2, login,). Simply drag your assets from Explorer and edit its variables from the Inspector. Game:Displays your game at different resolutions. It is a WYSIWYG view of your game. Initially games made with Unity 3D were a development for 3D games environment. Could develop 2D games environments and adjusting the parameters of your game to simulate 2D (orthographic camera, flat textures, etc), but being a strictly 2D environment some developers opted for other platforms such as Cocos2D, a priori better suited to 2D. 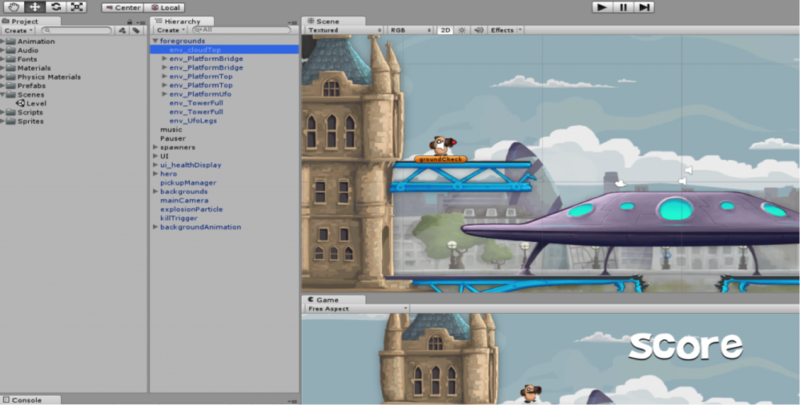 With their latest updates Unity 2D simplifies this process by allowing developments more easily, including new objects and effects to facilitate the development and performance of your game, as 2D textures, 2D effects of physical or specific types of camera. There are many examples of 3D games developed by Unity 3D. Currently more than 500 million users playing games developed with Unity 3D. In fact most of the best games for Android and iOS are made in Unity 3D, including Deux Ex: The Fall, for example. In 2D the percentage is much lower, being Cocos 2D the engine by excellence more used to date, mainly because Unity 3D had not been so far a robust option for developing 2D games, but also for the price, which is the main barrier at Unity 3D. However some companies like Rovio use Unity 3D as 2D engine, having developed successful games like Bad Piggies. Unity 3D a multiplatform which biggest advantage is that it allows Unity games for many platforms with really very little extra work. Unlike other technologies, at Unity 3D you have to do almost all adjustments to adapt and compile a game for iOS and Android, unless you want to use specific features of any of these platforms. The platforms are allowed virtually all existing and currently can be divided into 4 groups. Unity 3D allows developing foriOS, Android, Windows Phone 8 and BlackBerry 10.The full licenses for Windows Phone and BlackBerry are included in the basic license of Unity, mainly because otherwise very few developers would make this investment for these devices. IOS and Android, however, require additional licenses to complete development. To compile for each device you need some extra minimal work. Android, for example, you need to download and integrate Google Android apk. IOS is more complicated (as always): of course requires a payment in respect of Apple developer license with a current cost of $ 99 per year. Also you’ll need a Mac to make your final build. Whether you have developed Mac and PC (with Unity 3D), Unity does not generate the final file but an XCode project that you can open and compile your XCode Mac environment. Unity 3D allows developments for both browser and Facebook. All modern browsers allow you to play these games: Chrome, Firefox, Internet Explorer and Safari. Currently the games made with Unity (Unity 4.5 on your current version) are reproduced with the official Adobe Unity, Unity Web Player, which must be installed in your web browser to be used. Unity previously exported Flash files, but has stopped. In a few months, launch Unity 5 which allow playback of their games with HTML 5, making it much easier integration into web pages. You can also compile for PC, Mac and Linux. In this case the extra work performed is practically nil, except for Mac, which requires (again) a few extra steps. Unity recently announced that it is possible to develop free of charge games for PS3 / PS4, Wii U and Xbox 360. However, it is still not trivial to publish games for these consoles, at least for companies or small teams. While Unity do not require additional licenses, you do need development teams of different platforms that must be provided by Sony, Nintendo and Microsoft, respectively. Currently the developments made with Unity console are those with smaller budget, focused on downloads from the 3 consoles online stores. The first games offered by Sony for PS4 Plus users were made with Unity 3D. The most potent of these games consoles use other engines like Unreal. This is the main barrier for developers: the price of licenses. A developer can start with the free license, but there are limits. Necessarily includes the logo of Unity in the initial charge of your game and can only be used if the total turnover of your business does not exceed $ 100,000 annually. The Price of Unity Pro license is $ 1,500 per person plus tax. Allows use of all the features of Unity Pro on up to 2 computers (same person). The main improvements are in effect, textures and 3D performance. Simple games, and especially simple 2D games should not need these features. The Pro licenses for Windows Phone and BlackBerry are included in Unity Pro, but not the Android and iOS. Pro licenses iOS and Android Pro are priced at $ 1,500 each per person (excluding taxes). Are required, for example, for using .Net Sockets, multiplayer necessary for certain real-time applications. Other licenses such as license, Team License, or certain Assets also represent a cost. The sum of these costs is the main barrier to this technology, although greatly compensates for the time it saves development and product quality. Unity Asset Store Power of Unity is above the other popular technologies for mobile game development as Cocos2D, Flash, Marmalade or the use of native code. Yet this power can be enhanced with asset offered free or sold in the Asset Store. We recommend you study well what Unity offers at its shop because it could further reduce the development time of your project.